There’s never been a time in my life, which now spans 51 years, when the conversation in communities is so distanced from what state lawmakers choose to talk about. And the gulf only gets wider between the concerns knocking around state capitols and what Congress and the White House think is important. This isn’t a partisan problem. It’s a national disgrace. Our state government here in Michigan, for example, is led by a two-term Democratic governor, Jennifer M. Granholm, who began her administration with a very solid and popular economic development program. It called for investing in the state’s cities, protecting natural resources, securing open spaces, fixing roads instead of building new ones, promoting public transit, improving public education, and strengthening the state’s terrific public universities. Ms. Granholm also talked about leveraging public and private funds to encourage entrepreneurism and recruit new knowledge-based companies. The idea was to overcome the state’s hierarchical economic principles, forged in the factory floor/front office clashes of the 20th century’s auto culture, and produce clean, green, prosperous cities and inner ring suburbs that could attract the highly educated young people who rule the 21st century economy. The three most prosperous regions in Michigan — Ann Arbor, Traverse City, and Grand Rapids — actually thought highly of Ms. Granholm’s new strategy, embraced its basic principles, and have emerged late in the 21st century’s first decade as among the best places to live and do business in the country. Lesson: it worked. Ms. Granholm, meanwhile, was buffeted by her conservative opponents, a state economy that faltered, the nation’s largest fiscal deficit, and abandoned the strategy almost entirely. The new core of her economic plan is expressed by a scary sounding slogan to “go anywhere and do anything” to generate new jobs. This tendency of political leaders to govern as though they were at a buffet, picking and choosing almost indiscriminately from a myriad of interesting dishes, is emblematic of our drift as a nation. Great organizations develop core strategies and stick to them over time. Those that are most successful anticipate and adjust to new market signals, incorporate new ideas, and update their vision and goals in a careful and logical process. The same goes for successful businesses and productive lives. The idea is to write a strong narrative for yourself, your company, your state or nation that makes sense. Having a strong story, effectively and courageously executed over time, generally gets people close to what they’re after. Sharp changes in goals without consideration and anticipation is a story that has departed its narrative track and generally leads to failure in business and disappointment in governing. I’ve had the chance to apply these lessons to the presidential campaign of Mitt Romney, the Republican who was born in Detroit 60 years ago, raised in a political family, and governed for one term in Massachusetts. What’s interesting is that Mr. Romney’s first gubernatorial year, 2003, was distinguished by several acts which might otherwise be called progressive. Two are of particular note. Mr. Romney hired Doug Foy, the head of the Conservation Law Foundation and arguably New England’s most important environmentalist, to head a new Office For Commonwealth Development. And second, Mr. Romney charged Mr. Foy with developing and enacting a new economic development strategy for Massachusetts based on Smart Growth principles very similar to those that Governor Granholm talked about at the start of her administration the same year in Michigan. 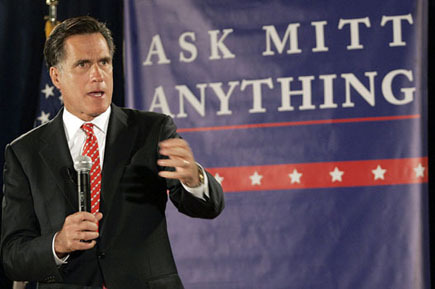 Though critics and supporters argue about the success of Mr. Romney’s initiative, one of its important achievements was embedding the idea that where state government decides to spend money for transportation, water, housing, offices, education, and the environment has a lot to do with where people choose to live, and where businesses choose to locate. The Environmental League of Massachusetts counts among the achievements in the last year that it made in collaboration with the state a $30 million investment in a state brownfield redevelopment fund, a major help for developers seeking to build on land in the Commonwealth’s older industrial cities and core suburbs. The state agreed to consider carefully the consequences to communities and land use for extending new water lines. The state also raised its Historic RehabilitationTax Credit to $50 million annually from $10 million, helping developers build in existing neighborhoods rather than promote sprawl. These and a host of other Smart Growth policies and investments helped to stabilize the state’s economy and contributed to the growing number of highly educated young people who’ve settled in Boston and Cambridge, both of which are experiencing moderate population growth, according to the Boston-based Metropolitan Area Planning Council. It’s a strong record of sound governance that produced real results. You’d think a former governor running for president might want to take note of what he’d done. But Mr. Romney doesn’t mention a word of it in his campaigns, on his Web site, in his speeches. His campaign is a dullard’s banquet of the same old — lower taxes, oppose abortion, support the surge, defend the family. His energy policy is about more nukes, liquifying coal as a fuel, and drilling for oil in Alaska. I travel in moderate liberal and conservative circles. There isn’t anybody I know who thinks that this governing formula will make America better.